Over the Fall Break, graduate students Grant Harley and Alex Dye accompanied Henri Grissino-Mayer to Fredericksburg, Virginia, to collect samples from a dismantled crib dam built in 1854 that was once across the historic Rhappahannock River. The massive logs represent old-growth pines (although we don't yet know which species) that once grew in the region and could potentially push our record of climate for this area back to the time Columbus arrived in the New World. The story is titled "Timbers from dam hold record of past: Wood salvaged from Fredericksburg's 19th-century crib dam may hold clues to pre-Colonial climate," and also also features a video of Dr. Grissino-Mayer talking to reporters about the significance of the wood collection. Visit http://www.fredericksburg.com/News/FLS/2011/102011/10022011/655354. Many thanks to Tim Kelly of the Woodwright Co. in Fredericksburg for making this trip possible. For more pictures of this incredible wood collection, visit Tim's site here. 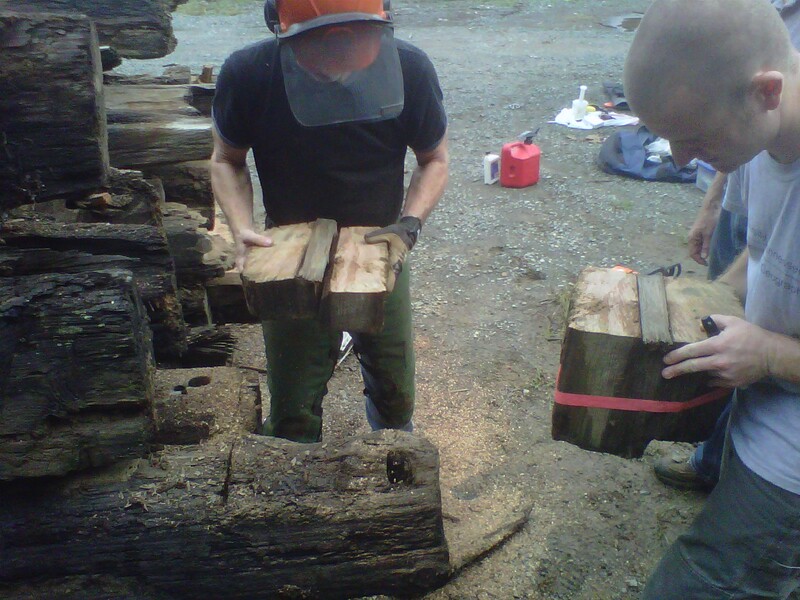 Grant Harley (right) and Henri Grissino-Mayer inspect a section of old-growth pine wood sampled from a historic crib dam in Frederickburg, Virginia. Notice the chain saw cut right through an oak peg used in the mortise and tenon joining technique. Students in the Geography 137 Honors section of the Introductory Physical Geography course spent Sunday, September 11, 2011 at the University of Tennessee Arboretum in Oak Ridge. Working with graduate students Joanne Ballard and Matt Boehm, and instructor Sally Horn, the students collected tree-ring and soil samples for research projects, and examined the NOAA meteorological station at the site. We are grateful to Director Kevin P. Hoyt for allowing us to use the excellent resources of the UT arboretum. For more on the arboretum, see http://forestry.tennessee.edu/ORForest.html. And to see our students in action, check out the video! Michelle Pfeffer's Legacy Lives on at TVUUC! This morning (September 7), the Knoxville News Sentinel published this very nice piece by Allison Rupp about the Tennessee Valley Unitarian Universalist Church (TVUUC) and their strong commitment to conservation, recycling, and restoration. In May, the church earned its Green Sanctuary accreditation, an effort begun six years earlier by our very own geography major Michelle Pfeffer, who tragically passed away in February 2006. Our Outstanding Senior Award is named after her. In August, Joy DuVoisin moved from a staff position in Geography to a staff position in Educational Psychology and Counseling. We thanked Joy for her work in Geography and celebrated her new position with a small party in the Geography Department. Geography faculty, students, staff, and friends gathered on Friday, June 3, at 2 pm in the seminar room for a baby shower to celebrate the arrival of Molly Grace Kalafsky, born April 28, 2011 to proud parents Ron and Kirsty. We welcomed Molly with cake, funny baby stories, and baby presents. John Rehder's untimely and all too soon passing on April 19, 2011,was quite a shock to the whole department. John was a kind man and a fine colleague and his death has created a large absence in the life and heart of our department. In that context, faculty and students in the department got together on May 7, 2011, at Dr. Harden's house to celebrate John's life and to strengthen our connection with each other. We are honored to have his wife, Judy Rehder, and daughter, Karen Rehder, at the celebration. For several hours, we shared many wonderful stories about John and we know that our lives have been enriched by John's presence and that anyone who spent time with him was better for it. David Mann: "Henri, Sorry to hear about John. He (and Sally) were the reasons I got interested in Geography. His love of culture always came through in all he did. We have lost a a very good friend. I am sorry I can not be there now. I am still in Afghanistan with the 101st in Kandahar and wont be back till June. Please pass my feelings on to everyone in our UT family. God Bless." Tim Frazier: "I am deeply saddened by the loss of such a good man. I took John’s cultural geography class while I was an undergrad at UT and loved every minute of it. He told amazing stories woven into class lectures that made going to class the highlight of my day. I also had many conversations with John outside of class where his support and confidence in me helped me be successful in grad school at Penn State. I know we all have some favorite Rehder stories and I have told countless ones to my classes now that I am a university professor making my classes far richer. I do find some solace in knowing that John will live on through all these stores and all the students he touched. LSU lost a Tiger, UT lost a Vol, and we all lost a friend. I will miss my friend." Annie Wambersie Strange: "What a tragic loss for the UT community. He was a wonderful professor and a truly kindhearted and compassionate person. May he always have his po'boys "dressed." Jill Brickey: "When I was a young undergrad, wanting to study geography and learn about the world, I took Dr. Rehder's Geography of Appalachia class. It made me love my home and planted the desire to study my backyard -- the Great Smoky Mountains. I always enjoyed listening to Dr. Rehder talk about his field work experiences and the different things he encountered whether he was buying penny candy at a local general store or drinking chicha beer in Bolivia. I definitely enjoyed his stories (all of them) and talking to him to hear about his latest research or his grandkids. My prayers are for his family." Daniel Lewis: "Dr Rehder told us a story in cultural geography class when I was an undergrad eons ago. He was in Bolivia I think, speaking with a village elder. The man told John one of his favorite foods was grub worms. John told him that sounded awful and he couldn't believe he would eat that. So the man proceeded to ask John what his favorite food was. John said "chicken". The man said, "chickens are filthy, nasty animals! I can't believe you would eat them"! It's all in your perspective, John said." Nicole Samu: "He had a way of making students feel comfortable speaking in front of the class...I remember him saying something like "just pretend like you're having a conversation with your brother or sister". He had something good to say about everyone. When I took his class as an undergrad was probably the first time that I didn't feel panic stricken throughout an entire presentation. I'm so grateful for him making me realize that that was even possible! He was a great person and professor and will definitely be missed!!" Desiree Kocis: "I took one of his classes as an undergrad years ago. I was still fairly new to TN, and was really homesick for Louisiana. His class was a blessing because, well, all he ever talked about was Louisiana! I only missed his class once... the morning of September 11th, when the Twin Towers were falling and our nation was crying. Wouldn't have missed that class for a lessor reason. A true character I will always remember." The department recently created the Outstanding Alumnus Award as a way of recognizing the professional accomplishments of our graduates. It is my high honor to announce that this year’s award goes to Dr. Sidney R. Jumper for Outstanding Contributions to Geography Education. There is no one more deserving of such an honor as Sid. Sidney Jumper received his Ph.D. in 1960 for a dissertation entitled “A Geographical Analysis of the Production and Marketing of Fresh Fruits and Vegetables in Florida, Georgia and South Carolina.” In the late 1960s Sid was teaching at Tennessee Tech when he was hired to return to his Alma Mater. Usually, hiring one’s own graduates is frowned upon in academia, but this was an exception that proved most valuable to generations of students at all levels. This is not hyperbole, it is not some sappy statement to make an old friend feel good. It is the God’s-Honest-Truth. In 1977 Sid was named department head to succeed Edwin Hammond who stepped down that year. 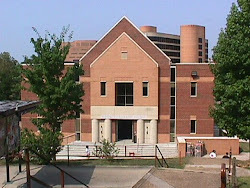 For the next 18 years the administration, faculty, staff, and students of this university were blessed to work with Sid. It is fair to say that today’s department was very much shaped by Sid’s leadership. During his period of leadership we added new faculty members, made strategic decisions on what we could and could not offer as specialties, put a new emphasis on research and scholarship, and perhaps most importantly developed a culture of open management and civility. In 1986 Dr. Jumper, along with Dr. Ted Schmudde, established the Tennessee Geographic Alliance, one of seven pilot alliances in the US. Form its humble beginnings the Alliance has grown to include nearly 5000 K-12 teachers, hosts a myriad of programs throughout the state, and is in many ways the epitome of what service and outreach are all about. Over $3.6 million has been spent on improving geography education in our state. Dr. Jumper’s contributions have not gone unnoticed. In 2001, the National Geographic Society announced the establishment of the Sidney Jumper Grant for Teaching Research. At the announcement ceremonies Gilbert Grovsner, the Chairman of the Board of Trustees at NGS not only praised the efforts of Sid, he also praised the support and sacrifices of Mickey Jumper, Sid’s wife. Several teachers have taken advantage of this scholarship to work with Professors Sally Horn and Carol Harden. Sid’s contributions continue today. Without his leadership the department would not be as strong as it is. We may not have secured the generous funding of William Burchfiel for the Burchfiel Geography Building. Students in our state would have teachers who are much less prepared to teach geography than they are today. It is right that we honor him. Sid once confided in me that such honors made him uncomfortable. The hero worship was a bit too much to take. We can’t help it. Sid is our hero. As I look at this audience of students and faculty in our department, I realize that every one of us has been touched by this man. One thought occurs to me again and again. How could we not love this man? Grant’s numerical scores and written comments demonstrate that he has a wonderful relationship with his students, providing a learning environment that goes far beyond simple textbook lessons and rote memory. Grant showed that he is a caring and approachable teacher, earning very high scores (4.0 to 4.4 out of 5.0) in the important categories of “Instructor’s Contribution to the Course, “ “Instructor’s Effectiveness,” “Course Organization,” and “Explanations by Instructor.” The written comments by his students affirm his effectiveness and ability to instill the thrill of learning: “Grant taught new information to me rather than repetitive facts as in some courses, and this made the class much more intriguing” – “I now know what is going on with the Weather Channel. And blizzards, too.” – The instructor presented material in a way that allowed for questions and discussion, prompting a better understanding of the material.” – “The class took into consideration understanding the material rather than memorizing it.” – “Grant made it exciting and fun to attend class and learn the material.” – “Grant had a passion for the subject.” – “Great class! Grant rocks. Give him a raise.” Grant is very deserving of the Outstanding Teaching Associate Award in our department! Rusty has shown high scholarly potential and he is an outstanding departmental citizen. Rusty's Master thesis on motorcycle guides in Vietnam provides insights into Vietnam's transition to a market economy, and it investigates the ways in which motorcycle guides create a tourism product. His findings contribute to our understanding of the role of small-scale entrepreneurs in the current economic transition in Vietnam. He conducted two months of fieldwork research in Vietnam in Summer 2010 to interview motorcycle guides, and he traveled extensively in Vietnam. Rusty presented his research findings in a poster at the SEDAAG conference in Birmingham, AL in Fall 2010, and he will give an oral presentation at the AAG meeting in Seattle next week. Rusty plans to submit an article to a tourism journal this summer. Rusty has been an outstanding departmental citizen, and his efforts set a strong example for future generations of graduate students in our department. Rusty has created a culture of sharing among human geography graduate students, and he is always willing to help other students. Rusty shared his thesis proposal and IRB application with several graduate students. He also showed his poster design to Scott Basford, an undergraduate student who prepared a poster for the Eureca conference. When Scott was working on his poster in BGB 206, Rusty provided helpful suggestions for the design. Scott remarked about Rusty that "he is very helpful and always approachable.“ Rusty volunteered for Geography Awareness Week twice. Last fall, Scott and Rusty were paired for Geography Awareness Week. The first day, Rusty explained the activities to Scott in detail, and he showed Scott what to do. Scott observed Rusty's performance on the first day to learn how to lead the activities. Rusty's explanations and leadership were so clear that Scott was able to lead a class session the next day. Rusty also provided refreshments for our colloquium series last Fall, and he prepared home-made food. Based on the observations above I highly recommend Rusty Kirby for a Robert G. Long Outstanding Graduate Award. Maria entered our program in Fall 2007, and is on track to complete her Ph.D. this semester. Her Ph.D. project concerns evidence of climate and environmental change preserved in lake sediments from Hispaniola. The project grew from work Ken Orvis and I began with National Geographic funding and for which we later obtained an NSF award that has supported Maria for a bit more than two years. Maria added several components to the project that were not part of the original grant project, including field work with ground-penetrating radar and additional limnological sampling for which she applied for and received a $12,000 NSF Doctoral Dissertation Research Improvement grant. She also carried out in-depth studies of diatom assemblages in sediments that were not a part of the original project. While at UT, Maria has made six presentations as first author at annual meetings of the Association of American Geographers, the Geological Society of America, the American Association of Stratigraphic Palynologists, and the American Society for Limnology and Oceanography. She has been co-author on several other presentations. 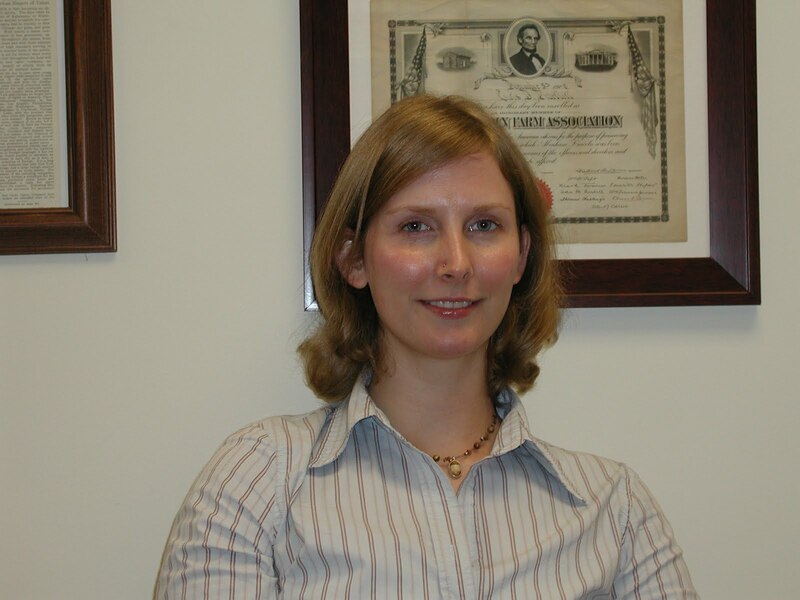 In 2009, her poster at the AAG meeting won “best poster award” from both the Paleoenvironmental Change Specialty Groups and the Biogeography Specialty Group. A manuscript on her M.S. thesis research is in press in the Journal of Latin American Geography, and she has also published in the George Wright Forum and in the Encyclopedia of Geography. Her dissertation is written as a series of papers intended for publication, and she will be able to submit these this coming summer. Maria has been very active in applying for grants, and has enjoyed considerable success. In addition to her $12,000 NSF DDRI award, Maria received a student scholarship award from the American Association of Stratigraphic Palynologists ($2000), a grant-in-aid (value ca. $7000) from the NSF Arizona Radiocarbon Lab, and a grant from Sigma-Xi ($1000). To help fund last year’s visit by science journalist David Quammen, which Maria spearheaded, she wrote successful proposals to raise $9000 from the University of Tennessee Issues Committee and $2000 from the University of Tennessee Cultural Affairs Board. She coordinated events during David Quammen’s visit, and was recognized by several faculty across campus for her professionalism in making these arrangements and seeking contributions from individual departments. The great success of the Quammen visit depended also on other graduate students, but a large share of the credit for the success goes to Maria. For her academic and research excellence, laboratory teaching and mentoring, overall professionalism, and important contributions to the department, I am pleased to recommend Maria for the Robert G. Long Outstanding Graduate Student Award. Ling is on track to complete her Ph.D. degree this semester. During her graduate study in our department, Ling served as a Graduate Research Assistant (GRA) for a total of three years on three different externally funded projects. She was a GRA of my NSF grant working on time geography, human activities in physical and virtual spaces, and space-time GIS. Ling also worked as a GRA on another NSF grant related to spatial optimization and high performance computing. In addition, Ling worked as a GRA on Dr. Ralston’s Department of Justice’s project. Ling delivered high quality GRA work and produced two refereed journal articles in highly regarded journals (Journal of Transport Geography and International Journal of Geographical Information Science). In both articles, Ling is the first author. In addition, Ling gave a total of nine (9) presentations at professional meetings such as AAG meeting, SEDAAG meeting, Crime MAPPING Research Conference, Computational Science for Natural Resource Managers Workshop, and International Workshop of GIS for Transportation. In 2009, Ling’s research paper was selected as one of the five finalists for the AAG GIS Specialty Group Student Paper Competition and received a $500 travel award. In 2010, she was chosen from a competitive process to participate in an Advanced Spatial Workshop at the University of California at Santa Barbara that was funded by the National Science Foundation. Ling also did outstanding work as a GTA in our department. For example, the SAIS student evaluation scores of her work as a GTA for Geography 415 in Spring 2010 are very impressive (see the Tennessee 101 website). These evaluation scores are hard to achieve and Ling did it. Beyond research and teaching, Ling also actively served our Department and participated in other professional service activities. In our Department, she served as a Web Assistant to help maintain our department’s web site, a guest lecturer for the Geography and Educational Technology Workshop organized by the Tennessee Geographic Alliance, a graduate student representative on our transportation geography faculty search committee, and a volunteer during the Geography Awareness Week in various years. Outside of our department, Ling was elected to a student representative on the Board of Directors of the AAG Transportation Geography Specialty Group (2007-2009) and was selected as a student assistant at the 2010 ESRI User Conference. She also served as a liaison of the Newsletter Editorial Committee for the Association of Chinese Professionals in Geographic Information Systems and a mentor for the Transportation Academy sponsored by the Center for Transportation Research at The University of Tennessee. Overall, Ling has demonstrated strong research, teaching, and service achievements as a Ph.D. student. As a student working full time at NIMBios, Eric is a great example of someone who is always enthusiastic and excited about what goes on in the department, even after a stressful day at work. Eric works at NIMBios as a High Performance Computing Specialist and that is where much of his interests are. While Eric and I have different backgrounds and different research interests, he is constantly teaching me something new every time I see him. We have discussions about methods and research often, and I think I always learn something from him and he is always questioning different research and topics. He is truly a critical thinker in that he always has multiple viewpoints on the same issue and can come up with interesting questions very quickly. Not only does he enhance the intellectual atmosphere of the department, he also is very helpful to individuals and their own goals. Eric is one of the most passionate students in the department in my experience and has made a great effort to be a part of department functions on a regular basis. This is no easy task for someone with a full time job, but I think Eric works with the two responsibilities better than most. If you discuss your research with Eric, you will always receive useful information whether it is related to data availability, different methods or even asking different research questions. He questions everyone’s research not to bring it down but to improve your ideas on it and think about the best approaches. While our interests are quite different and sometimes I am lost on the specifics, Eric represents the kind of graduate student that I wish I was. Eric is someone who is always thinking about new ideas and new approaches and always has helpful suggestions for others. We wish to nominate master’s student Niki Garland for the Outstanding Teaching Assistant award. A total of 41 students completed the ratings forms for Niki, and the students in her laboratory sessions were more than pleased with the laboratory sessions themselves and with Niki as a competent and helpful teacher. In the first lab, Niki received a perfect score -- 80 “excellent” ratings and not a single “okay” or “poor” rating. In the second lab, Niki received 83 “excellent” ratings, one “okay” rating, and no “poor” ratings. The students comments were ringing with ebullience about the quality of Niki’s teaching: “Was asked questions over and over, but Niki was patient and explained everything” – “She knew the information very well.” – “She brought her “A” game every day.” – “Niki was extremely helpful and wanted us to learn the material.” – “She was always cheerful and enthusiastic.” – “Niki was very helpful and nice to all students.” – “She really understood and could explain the material.” – “Niki never got frustrated with any students.” Niki received not one negative comment! These comments and phrases like “awesome,” “great,” and “helpful” testify to Niki’s ability to connect with her students to provide a welcoming and rewarding learning environment for the students in our lower-level classes. Niki is very deserving of the Outstanding Teaching Assistant Award in the Department of Geography! Peggy Jackson is an excellent teaching assistant. She anticipates needs and follows directions to the letter. Peggy is a great asset to any instructor, making their lives easier. Not only did she complete her own duties as TA, but also organized and managed the other TAs in the class, taking a huge load off of my plate. Peggy never needs to be told what to do. She contributes to class and is a model for other TAs to follow. Being chosen to serve as Head GTA for Geography 132 is very significant recognition of outstanding work as a Graduate Teaching Assistant, and his excellent work this semester as head GTA has showcased Derek Martin’s competence, knowledge, good humor, and professionalism. Meanwhile, the students in his labs, even those who didn’t like the labs, noted on their evaluations that he was always willing to help them and that he had a way of explaining things that really helped them understand. Many of them noted that he really wanted them to learn, and they even appreciated that he made them think and did not tell them the answers. Remarkably, 12 of the 40 students who completed evaluations for Derek Martin in 131 said they had met with him during office hours, some of them numerous times. That’s way above the average (estimated at 0.0001 percent) and demonstrates his ability to connect with the students, as well as the respect they had for his knowledge and teaching. Student comments about Derek as a GTA ranged from the low-key “he was always helpful and explained things in a way we could understand,” to more enthusiastic comments, such as ”Derek is awesome!” and “Mart is the man!” Even his beard got top honors, as in “His beard is righteous and worthy of glory.” I nominate Derek Martin (beard and all) for an outstanding GTA award. Although this is his first year in our program, he will be moving into a Graduate Teaching Associate position next fall. He is now one of the few doctoral students in physical geography who will be available to teach labs, so it is quite possible that this is his last semester as a Graduate Teaching Assistant. Kevin has done an outstanding job completing his duties as the teaching assistant in Geog 310 and assisting with map projects in the cartography lab. In Geog 310 he goes the “extra mile” to assist students with class assignments and maintains a good, approachable relationship with them. Many times I have observed him take the time to criticize a student’s map work. Then he will turn that criticism into a teaching opportunity and discuss with that student how things could be done in a more effective manner. He does an excellent job with his grading responsibilities and maintains the class records quite well. Kevin participates in class and lab discussions, which add to a team style of teaching that greatly helps our undergraduates learn the finer points of mapmaking. He is technically knowledgeable in GIS, which is also a plus during the teaching of this course. In the Cartography Lab he has helped with, or completed, several map projects that have been used in professional publications for our faculty and faculty of other UT Departments. He is currently helping me research ideas and techniques that will improve the usefulness of the UT Campus Map. Kevin is a very dependable and self-motivated worker. His hard working, pleasant disposition make him a pleasure to work with and I would have to rank him among the top workers I have had in this office. Informal feedback indicates Alice is also a much appreciated 132 GTA this term. She is highly deserving of a Department of Geography Graduate Teaching Assistant Award! Since beginning the graduate program in the fall of 2010 Melanie has thrived. Her research on the truth and reconciliation movement in Boston has the potential to transform legacies and geographies of violence and is socially relevant and critically engaged with inequality and social justice. In addition, her project is expanding and refocusing her advisor's research. Melanie's research acumen was recognized by the Qualitative Research Specialty Group through their Research Grant Program and is indicative of her progress as an aspiring academic. This award will facilitate in her fieldwork this summer that will be conducted in Boston, MA. In addition, Melanie has emerged as a leader in the department. She helped organize the Geography Awareness week activities and her presence in the department has made her a dependable and reliable student. Her leadership potential was recognized when she was asked to take over the "Brown Bag Series on Professional Development", a job that is normally reserved for a more senior PhD level student. Melanie always maintains a positive attitude and is excited to go to as many conferences as possible to meet people in the field. Her attitude is evident by the amount of effort and time she spends to make sure she is involved in all aspects of the department. As Dawn Drake and Ben Shultz finish their doctoral studies at UT, the department would like to thank them for their extraordinary service throughout the past four years. Where to begin? Ben & Dawn have served as role models for human geographers in many ways but a few quickly come to mind. Despite their busy schedules, commitments, and workload as they moved rapidly through our program, they were never too busy to answer questions from other grad students, serve on committees, or to help others in any way possible. Their positive, can- do attitudes always contributed to the social glue of our department, and they will truly be missed. Caffrey, M.A., Taylor, M.J., and Sullivan, D.G. In press. A 12,000-yr record of vegetation and climate from the Sierra de los Cuchumatanes, Guatemala. Journal of Latin American Geography, 10(2). (Will be in September 2011 issue). Ling Yin, Shih-Lung Shaw, Dali Wang, Eric Carr, Michael Berry, Louis Gross, and Jane Comiskey. A problem-solving framework of integrating GIS and parallel computing for spatial control problems - A case study of wildfire control", International Journal of Geographical Information Science, accepted with minor revision. Drake, D.M. and R.V. Kalafsky. "Entry into China and market intelligence: Machine tool exporters as a case study in human geography." Education About Asia, in press. Drake, D.M. "Agriculture, Economics, and Milk." In Food and Famine in the 21st Century: Volume I. William A. Dando, Ed. Santa Barbara: ABC-Clio (forthcoming 2012). Drake, D.M. "The US Farm Machinery Industry in a Global Market." In Food and Famine in the 21st Century: Volume I. William A. Dando, Ed. Santa Barbara: ABC-Clio (forthcoming 2012). Niki A. Garland, Henri D. Grissino-Mayer, Kathleen Deagan, Grant L. Harley, and Gifford Waters (Accepted). Dendrochronological Dating of Wood from the Fountain of Youth Park Site (8SJ31), St. Augustine, Florida, U.S.A. To be published in Tree-Ring Research. L. De Grandpré, J.C. Tardif, Amy E. Hessl, Neil Pederson, F. Conciatori, Timothy R. Green, Oyunsannaa Byambasuren, and Bataarbileg Nachin. "Climate Signals in Pinus siberica, Pinus sylvestris and Larix sibirica Tree- Ring Chronologies from North-Central Mongolia: Change in Climate Sensitivity". Accepted by the Canadian Journal of Forest Research. Harley, G.L., H.D. Grissino-Mayer, and S.P. Horn. 2011. The Dendrochronology of Pinus elliottii in the Lower Florida Keys: Chronology Development and Climate Response. Tree-Ring Research 67 (1): 39–50. (Submitted July 2010). Polk, J.S., G.L. Harley, R. Brooks, L. Elder, and T. Turner. 2011. The Karst Conservancy’s Efforts Toward Cave and Karst Protection and Education in the United States. NSS News, April 2011, In Press. (Submitted November 2010). Harley, G.L., L.B. LaForest, and H.D. Grissino-Mayer. 2011. Dendrochronological Dating of the Lund-Spathelf House, Ann Arbor, Michigan, U.S.A. Tree-Ring Research, In Press. (Submitted July 2010). Harley, G.L., J.S. Polk, L.A. North, and P. Reeder. 2011. Application of a cave inventory system to stimulate development of management strategies: The case of west-central Florida, USA. Journal of Environmental Management, In Press. (Submitted September 2010). Garland, N.A., H.D. Grissino-Mayer, K. Deagan, G.L. Harley, and G. Waters. 2011. Dendrochronological Dating of Wood from the Fountain of Youth Park Archaeological Site (8SJ31), St. Augustine, Florida, U.S.A. Tree-Ring Research, Accepted pending minor revision on March 24, 2011. (Submitted July 2010). Philip B. White, Saskia L. van de Gevel, Lisa B. LaForest, Georgina G. DeWeese, and Henri D. Grissino- Mayer, 2011. Climatic Response of Oak Species across an Environmental Gradient in the Southern Appalachian Mountains, U.S.A. Tree-Ring Research 67(1): 27–37. Grant L. Harley, Henri D. Grissino-Mayer, Lisa B. LaForest, and Patrick McCauley, 2011 (Accepted). Dendrochronological Dating of the Lund-Spathelf House, Ann Arbor, Michigan, U.S.A. To be published in Tree- Ring Research. Stewart, R.N. and Tom Purucker. (2011) "An Environmental Decision Support System for Spatial Assessment and Selective Remediation." Environmental Modelling and Software, Vol 26 (6), p. 751-760. Lane, C.S., Horn, S.P., Orvis, K.H, and Thomason, J.M. Oxygen Isotope Evidence of Little Ice Age Aridity on the Caribbean Slope of the Cordillera Central, Dominican Republic. Quaternary Research, forthcoming. Ling Yin, Shih-Lung Shaw, and Hongbo Yu. 2011. Potential effects of ICT on face-to-face meeting opportunities: A GIS-based time-geographic exploratory approach, Journal of Transport Geography, 19(3), 422- 433. David White is the department’s Outstanding Graduating Senior. He will be recognized as such by the college at the graduation ceremony. David’s involvement with the work of the department was extraordinary. He worked with Micheline on her research on the recruitment and retention of IT specialists in Bangalore. He wrote a paper about talent recruitment, “The Creative Metropolis in America” that won a prize at the recent Eureca conference last month. David is a joint major in geography in political science. He will be entering the planning program at the University of Minnesota in the fall. Well done and good luck David! This is an award from the department’s heart. It’s named after Michelle, one of our majors, the first recipient of the award. She was a fine student and an extraordinarily giving person. She was diagnosed with a fatal illness in her November of her senior year and she died in February. She left a journal in which she recorded her thoughts in those final weeks. How anyone so young and with so much to live for could have faced death with such calm courage was beyond me then. It’s beyond me now. Putting a student’s name on her plaque in the hall is the greatest honor we can bestow. This years winners are Scott Basford and Sarah Jones. Quote from Dr. van Riemsdijk: “I’m truly impressed with Scott's critical thinking skills and his eagerness to learn. He asks high-level questions and he analyzes problems from various angles. He effortlessly integrates theoretical concepts into his reasoning and he is a good writer. His fact-finding is top-notch and he critically thinks about the data that he collects.” Scott also presented at the Eureca conference and also cleaned up with his study of the expansion of Church’s Chicken in India. His poster, along with David’s and Sarah’s is on display on the third floor of BGB. Check it out. As for Sarah, she’s a dynamo. Her accomplishments is startling. From Dr. Grissino-Mayer: Sarah has been o Dean's List every year from 2007 to 2010 (and likely again in 2011), and sixteen items later, he finishes with: Participant in the 21st North American Dendroecological Fieldweek, Blacksburg, Virginia, 2011. Sarah is also a Eureca prizewinner. In 499 Sarah and Sean Baskin gave a presentation on their dendro work in New Mexico last summer. With the help of Henri and Bruce Ralston they extended it into their winning Eureca presentation, “The Spatial Dynamics of Ponderosa Pine. El Malpais NM, New Mexico”. Congatuations, Sarah.